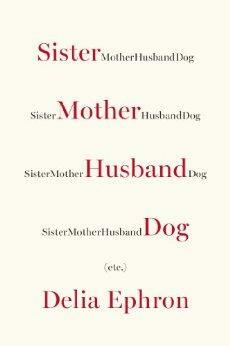 Sister Mother Husband Dog (etc.) by Delia Ephron is a delightful collection of autobiographical essays. The stories are sad, humorous, witty, and revealing. The book opens with a story about the passing of Delia’s older sister, Nora. I thought this was a sad note upon which to begin a book, but completely understand the choice of placing it at the beginning as a way of honoring Nora. There are essays about living with alcoholic parents, her beloved dog, bad hair days, technology and bakeries. I especially enjoyed and could relate to the many insights about writing contained in the book. This is a quick read; one I enjoyed spending time with. This entry was posted in Uncategorized and tagged autobiography, Books, Delia Ephron, Nora Ephron, Sister Mother Husband Dog (etc). Bookmark the permalink.